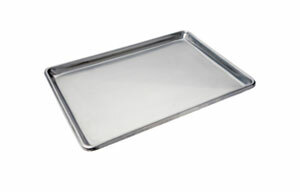 Stainless steel sheet pans constructed of heavy-weight 20 gauge stainless for greater strength and durability. Open bead edge is easy to clean. Resistant to pitting and corrosion. 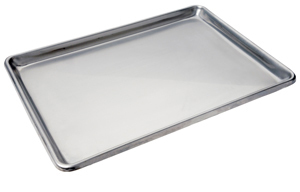 Non-reactive stainless steel will not affect taste or color of foods cooked on the surface. Dishwasher safe. NSF certified. This versatile colander features a perforated 18-8 stainless steel mesh basket that will finely strain and is easy to clean. Lets you keep water or oil in place while straining out food products. Welded wide 18-8 stainless steel handle. 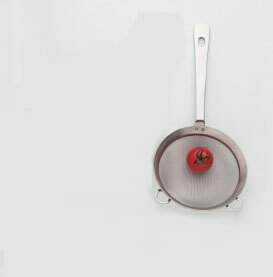 18-8 stainless steel strainer with a real fine mesh. Welded handles for durability. Size Large. 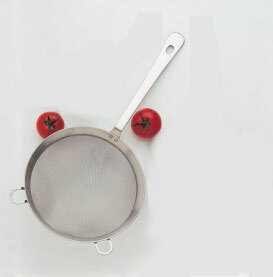 18-8 stainless steel strainer with a real fine mesh. Welded handles for durability. Size Medium. Made from mirror finished stainless steel. Welded handles with hanging hole. 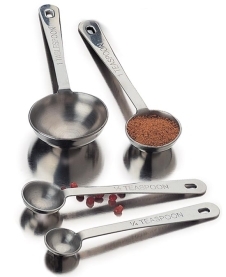 4 Piece measuring cup set - 1 cup (240 ml), 1/2 cup (120 ml), 1/3 cup (80 ml), 1/4 cup (60 ml). These tongs offer the benefits of non-scratching, 400 deg. 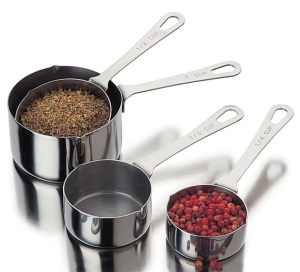 F heat-rated nylon with sturdy, heavy duty 18/8 stainless steel handles. Top Locking Tongs, with black nylon tips.